A border crossing today, so an early start with the slower riders heading out first so that we rendezvous at the first checkpoint. The main Pamir Highway heads east to a crossing that is not open to tourists. 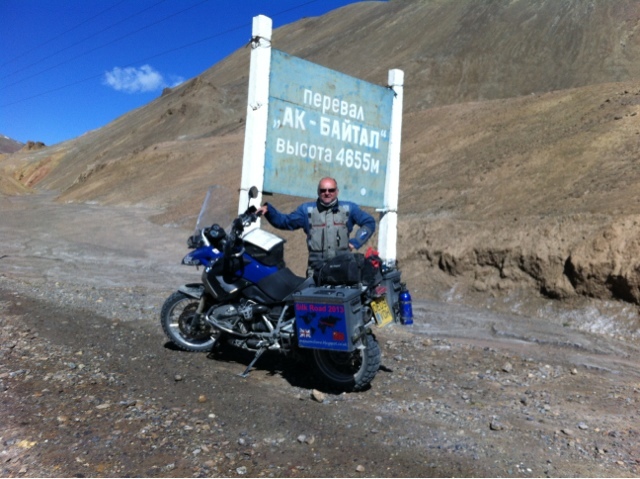 We turn north over a pass of 4655m to the border. The border post is where Tajik soldiers who have really annoyed someone get sent for two years. It is built out of shipping containers and oil tankers with windows cut out of them. No one has tidied up since Lenin was a lad. The only bright spot was the smile on the face of the officer when he saw 15 tourists and the opportunity for little something to make "problems" go away. The road from the Tajik border to the Kyrgyz one is 10km that clearly neither side has an interest in maintaining. Luckily it was dry. When wet it would have been a mud bath. And then out of the Pamirs and across the flood plain to Sary Tash for our home stay. Stopping at the petrol station, Deefor had an in depth discussion with the operator about Man Utd's prospects without Sir Alex before filling up. All set for tomorrow's run to our final border crossing into China.